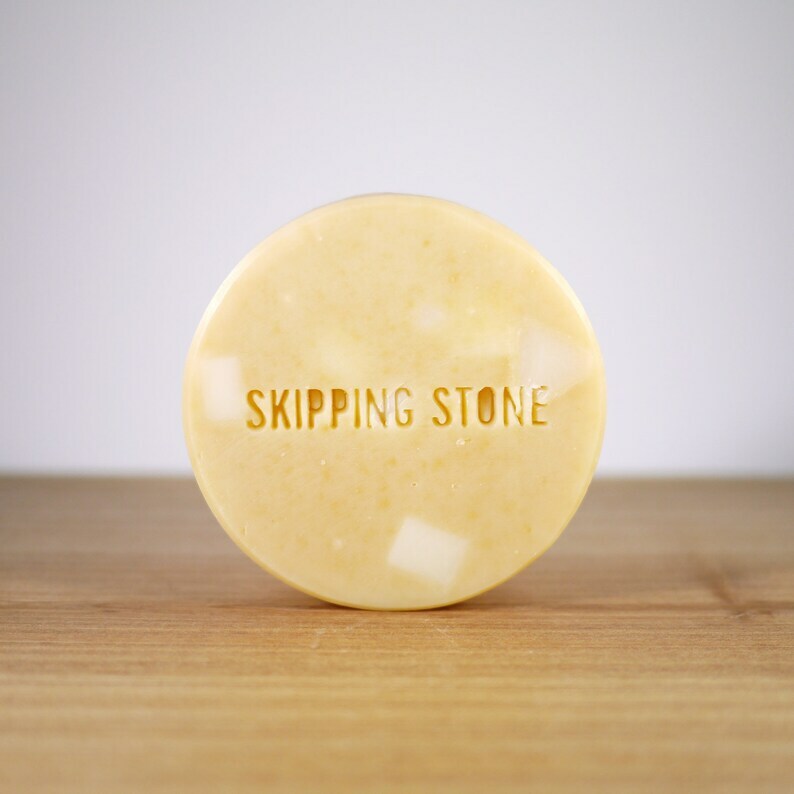 A full-size shampoo bar weighs approximately 3.3 oz/92 g and is sized at 3" diameter and is 1" thick. We also have a trial size which is 1/4 of the full-size bar, half-moon shape and half the thickness. Each bar is minimally wrapped in a recycled paper label. * This soap contains NO synthetic chemicals such as: sodium lauryl sulphate (SLS), detergent, preservatives, fragrance oil, paraben, phthalate, alcohol, urea, silicone, synthetic colourant, EDTA, TEA, and DEA. And no plastic bottles. The shipping costs posted are based on the furthermost distance from our shop in Toronto (e.g. for Canada it's from Toronto to B.C., for the US it's from Toronto to Hawaii) and usually calculated higher than the actual cost. If we have overestimated the cost of shipping by more than a dollar we will contact you and issue a refund for the difference. For more info about our shipping policy, see the below link. Smells a-mazing, can’t wait to use! Thanks! They smell amazing, a lot bigger than I expected them to be for Trial Sizes, and I really hope all of my friends and family enjoy them as gifts this holiday season! First all, it smells wonderful and packaged so nicely. I used it for the first time this week and my hair feels so clean and smells great. It’s a nice sized bar that should last a while. We accept PayPal and Etsy Direct Checkout (all major credit cards). If payment is made with an eCheck, your order will be processed once your eCheck is cleared (3-5 days). Payments are accepted in Canadian dollars. Orders may be cancelled as long as the package has not been shipped. Refunds and cancellations may take up to five (5) business days to process. Due to the nature of our products, we are not able to accept exchanges or returns. However, if you need a refund or are unhappy with our products for any reason, please contact us as soon as possible and we will be happy to work with you to find a solution. If damage has occurred during shipping, please provide a short message with a photo of the damaged items within 7 days after delivery and we will respond with a solution. All orders are shipped from Toronto, Canada within 10 business days after payments are received in full. We ship with Canada Post Expedited delivery (Canada), Small Packet Air or Expedited Parcel (USA, we choose the most economical way based on the weight of the package) and Small Packet Air or Surface (International). Shipping to Ontario and Quebec addresses usually costs less than the posted amount. (If we have overestimated the cost of shipping by more than a dollar we will contact you and issue a partial refund. If you are an international shopper, please contact me directly and we can work out shipping prices. Surface option is also available to save you on shipping if you don't mind waiting longer. Buyers are responsible for paying additional customs charges if applicable. Tracking for international shipping is not available. Unfortunately, lost packages happen sometimes for various reasons. If your package does not arrive, please contact us. We will do our best to sort it out. At the time of checkout, please verify the shipping information. If a package returns to us and needs to be reshipped, additional shipping fees may be required. If you have a special shipping request, such as upgraded shipping or a gift address, please send us a message before purchasing your item so we can work it out for you. The statements made on this site have not been evaluated by Health Canada or the U.S. Food & Drug Administration. These products are not intended to diagnose, treat, cure or prevent any disease. If a condition persists, please contact your physician. If you are pregnant or have a medical condition, please consult your physician before using any product containing essential oils. We list all the ingredients in each listing. If there is an allergy concern it is buyers’ responsibility to check this before purchasing the item. All of our products are for external use only. Discontinue use if rash, redness or itchiness occurs. Thank you for reading our shop policies. If you have any questions that are not covered here, please send us a message!